Heat olive oil in fry pan on medium heat. When the oil is hot, add onion and cook until the onions start getting golden. Add garlic and chilli – cook until the garlic is fragrant (until you get that nice smell that makes you hungry! Yum!). Add the mince and keep mixing to make sure that the mince is nice and crumbly (not lumpy and in large pieces). Add spring onions, sugar and lemon juice and keep cooking until the mince is golden brown. Add 1 large zucchini and cook for approximately 2 – 3 minutes. 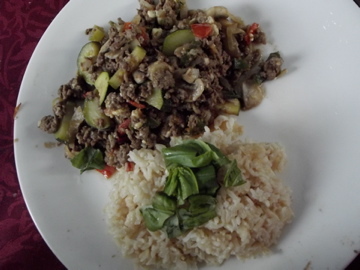 Add mushrooms and continue cooking for 1 – 2 minutes, until the mince is well cooked. Add the tomatoes and seasoning according to your taste. Cook until the tomatoes are tender. Turn off the heat. After approximately 1 minute (when the food has cooled down slightly) add the feta (crumble it with a fork) and mix well. If there are bits of feta still visible, don’t worry – you can enjoy the taste of these feta bits with the mince – yummy! Next Post Early start to New Year resolutions: Bring on 2013! thats to begin a great week..